Matting- To enhance the appearance of your project, we offer a variety of acid free matting with different styles such as white core, black core, fabric, suede, leather look and even some special effects like golf, football or basketball finishes or camouflage. We have mats in the pro or college team colors. Design of the matting may include single, double or triple mats, pen lines, reverse bevels, spacers between the matting or a custom shape that complements your personal project. Openings such as a train, mickey mouse ears for Disney items, animal shapes for pets, Christmas shapes for seasonal memories…the ideas are endless. Our designs will provide proportional dimensions that are most appealing for the image and frame. Frames – Our shop has one of the largest collections of frame corner samples to choose from, including wood, metal, decorative, ornate, inlaid or fillets. We will help you make sure it is the right choice to compliment your project without distracting from your intended focal point. Glass- The glass helps to protect and preserve the original piece. It may also be anti- reflective or non-glare in areas of bright light. Standard glass, low-E, uv filter/ conservation, or museum are among your choices. Ask us to explain and show you the difference. Shadow Boxes- Frames with depth to accommodate team jerseys or a collection of your pictures and memorabilia. We have recently framed a fireman’s ax and memorabilia as a retirement piece. 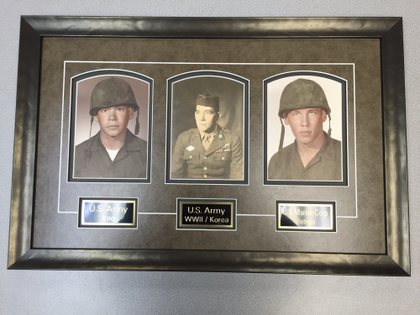 We often do military uniforms or military medals, bars and commemorative items and flags. We have framed baby items, baby shoes, locks of hair, coins, records, concert tickets and souvenirs, antique tools, cameras, bibles, lace, tatting and doilies, hole in one golf balls, signed baseballs, team uniforms, shoes and gloves, personal items and collectables. Display Cases – We make display cases for footballs, baseballs, basketballs and helmets with glass tops and sides so the surface does not scratch when it is dusted or washed. We do not use acrylic or buy the premade bases. We can customize with your base choice to match your décor. We want to produce the best finished piece possible. Framed Prints – Frame of Mind has a small art gallery on site where we offer a selection of framed sports team art and licensed photos. We like to keep on hand some pieces of signed Packer art, Limited Edition Packer art and poster art. If you don’t see what you are looking for, have something different in mind for your walls, we have a selection of print catalogs on hand you can view and we will order it for you. Canvas stretching or stitchery and cross stitch stretching. 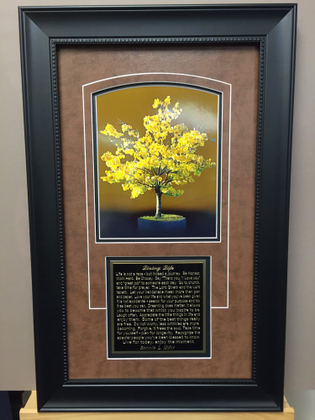 We are one of the few companies that will stretch your canvas artwork. Many of the other picture frame shops refer the job to us. Canvas wrap on stretcher bars or mounted using techniques discussed under mounting. Mirrors – choose a frame moulding to compliment your décor. We also have a hanging system for mirrors that can handle the weight. Choose from regular or beveled mirrors, custom sized for your space. We have done many for bathroom remodeling, over a dresser or a full length for your dressing area. Mounting- the method used for keeping your artwork or photos from waffling, keeping them flat. Options are regular dry mounting or archival dry mounting, wet/cold mounting for heat sensitive artwork, lamination or textured lamination such as used to make an inexpensive print look like a canvas. Mounting with lamination is often used for maps. You have the choice of mounting a canvas, particularly if it is old or brittle thru the wet/cold mounting process rather than stretching it across stretcher bars. Canvas mounting can be done as a gallery wrap for those who do not want a frame or stretched and framed to maximize the image. 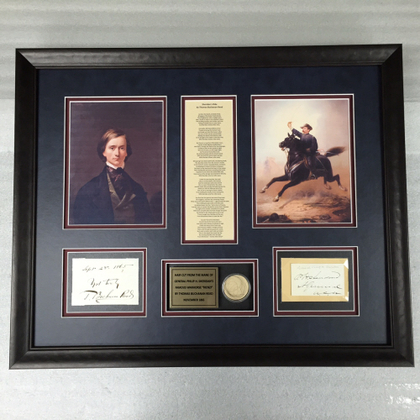 Plates or pins may be added to your project to commemorate an event, date, or honor a person. We can order these to fit with your project. Choices of brass or silver or black brass and a backer plate are available. We often use these to memorialize someone’s service or life. 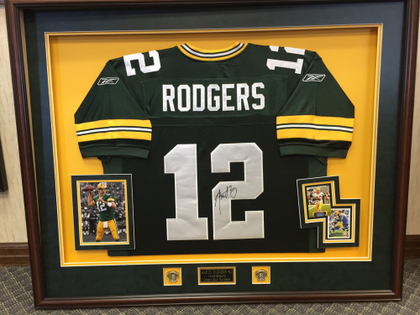 This is a very nice addition adding that finishing touch to a team jersey or a particular player’s memorabilia.